We took a morning train from Milan to Venice and arrived around noon which gave us most of the day for exploring and lunch. We walked around to get our bearings and grabbed lunch on the Grand Canal to watch a historic boat race that happened to be going on that day. This t-shirt/sweatshirt like dress was super comfy for train travel and for lots of walking too. Our first night in Venice we spent doing a gondola tour through the Grand Canal and many of the side streets. It’s obviously a tourist attraction, but a great way to see the city and romantic too 🙂 . 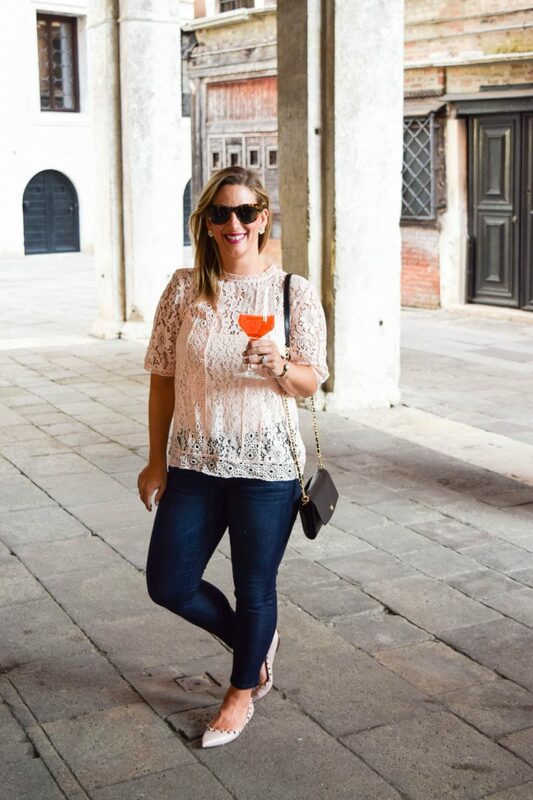 We’ve worked with the same Italian company to help plan our trips in the past and this time they planned a fun Aperol Spritz and cicchetti (little snacks/appetizer) tour. Think of it as an Venetian bar crawl with yummy cocktails and the most delish snacks- we loved it! 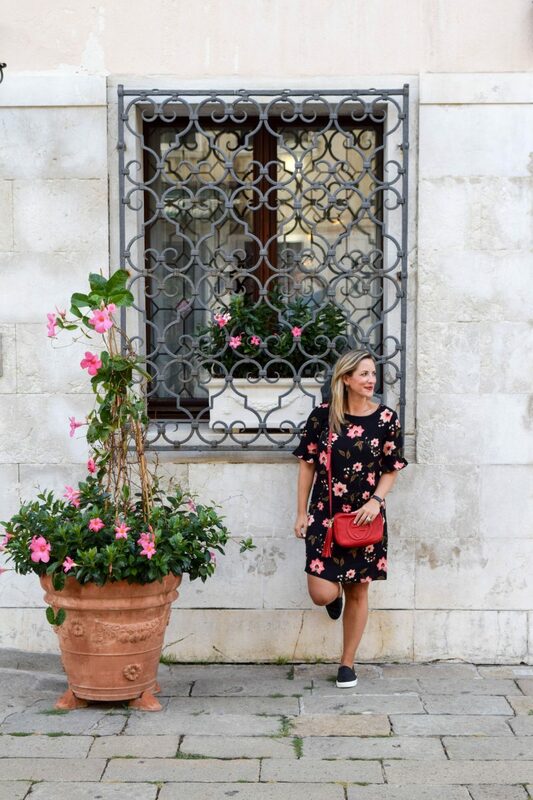 Snapped this pic outside of our hotel before heading out for the day- the flowers there were dreamy! The second day was our fullest day in Venice complete with a walking tour, a tour of St. Mark’s Basilica and a tour of the Doge’s Palace. 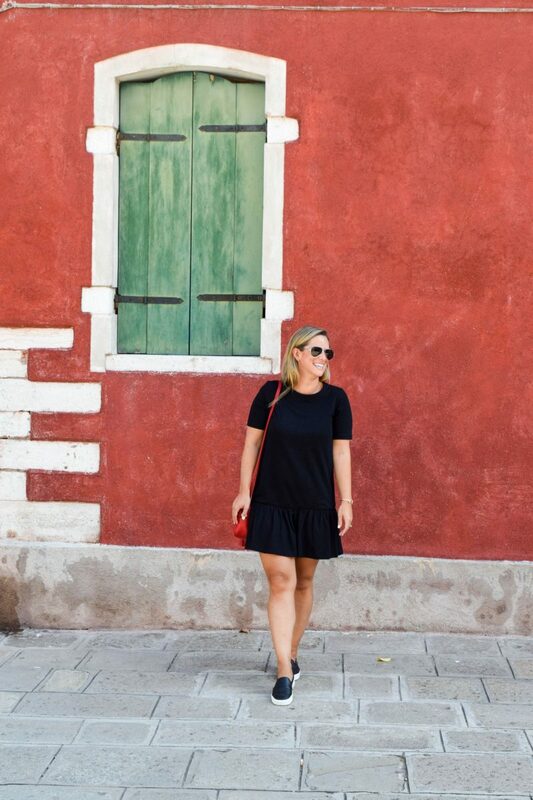 Don’t worry- we also saved plenty of time for hopping around restaurants and taking in sites on St. Mark’s Square for people watching and Aperol Spritz drinking. We took the ferry over to Murano and explored for the glass shops, the glass museum and the colorful island for about half a day. When we got back to Venice, we were hot and it was the perfect excuse for gelato on the water. Not sure why but pictures aren’t showing the drop hem detail of this t-shirt dress. It makes it a bit more fun! While obviously our whole trip was an anniversary celebration, our last night we went out for an extra special dinner and so I wore this goregous Shoshanna dress. We had drinks at our hotel’s roof deck before dinner and snapped this pic at the hotel’s outdoor terrace right on the water. I died over all the pink! 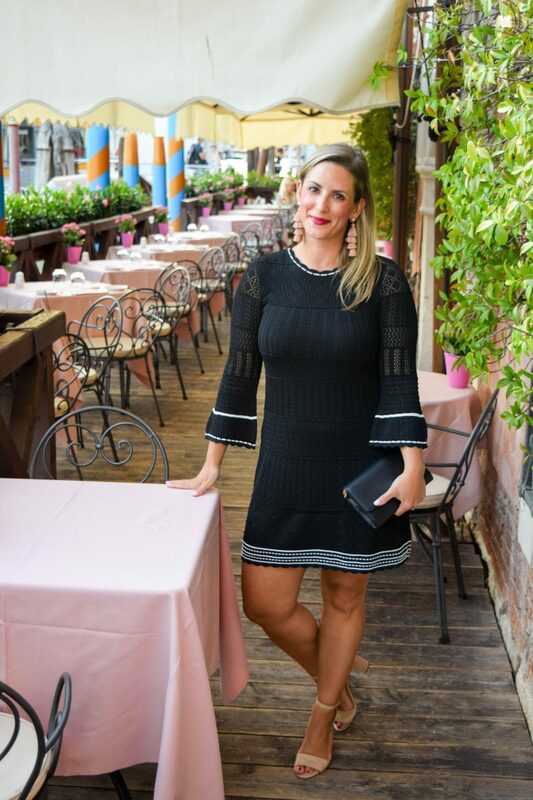 Our dinner was beyond yummy so be sure to check out my Venice travel guide for all the recs! 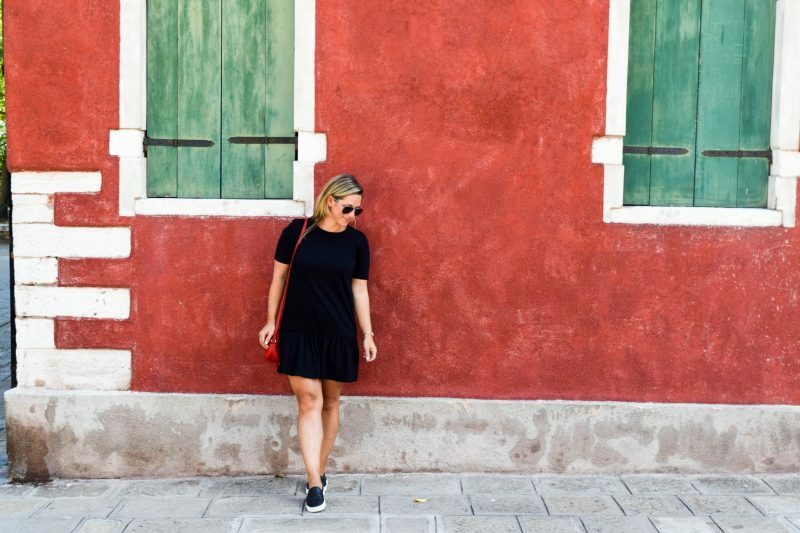 What’s your favorite look from our trip to Venice? Leave me a comment below with your faves!